A heart-transforming cure for the chaos that endangers your joy, your heart and your soul. I'm too busy. We've all heard it; we've all said it. Sometimes being busy seems like the theme of our lives. Yet this frenetic pace poses a serious threat to our physical, social and even spiritual well-being. 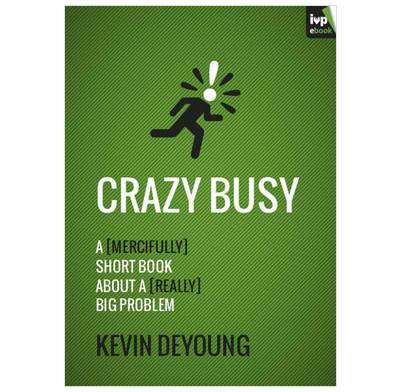 In this mercifully short book about a really big problem, best-selling author Kevin DeYoung rejects the 'busyness as usual' mindset, arguing that a life of constant chaos is far from what God intends. DeYoung helps us figure out a better way forward, as he strikes a mature and well-reasoned balance between doing nothing and doing everything. With his usual warmth, humour and honesty, DeYoung deftly attacks the widespread 'crazy busy' epidemic and offers up the restful cure we've all been too busy to find. Everything Kevin DeYoung writes is biblical, timely, and helpful for both life and ministry. You can’t afford to miss what he says here in Crazy Busy. He rightly reminds us to beware of the barrenness of a busy life, since activity and productivity are not the same thing. I was given this as a present and thought to myself, 'I've read a Christian book on busyness previously, I'm too busy to read another one' but I am very pleased I did. It's easy to read, relevant and Biblical. The reminder that we are not the Christ, ie we are not to try to play the role of saviour, the chapter on parenting, and the practical acknowledgement that Christians will generally be busier than non-Christians, were all especially useful. I know two other friends who have read it and we would all recommend it highly - it doesn't offer a miraculously, easy answer to busyness, but does offer a helpful Christian perspective. Brilliant practical book All the better for being short.